An Old Port In A Storm? Misleading terminology and descriptive is something the brewing industry has been most adept at using over the centuries as a sales tool, something that has always seemed lax in terms of legislation and control. In some cases this may not have been done blatantly to dupe the consumer, but exaggerating a products credentials however obviously gives it greater sales appeal. I was reminded of this recently when I came across a bottled product with an interesting name 'Old Port Scottish Ale'. In itself there is nothing wrong with this, and could apply to any number of top fermented ales that are produced around the world that mimic the 'Scottish' style of malt accented strong ales, with relatively low hop rates, and an inviting tawny reddish hue. The origins of the style are really a reflection of the location itself, where climate and agricultural conditions influenced the beers composition. Whilst malting barley could be grown successfully, the hop could not, being too northerly for the fastidious plant. But it was the warming malt fullness, character, and strength that made it the essential style for the harsh northern winters. It is the ale equivalent to the other famous product of those Isles which originally had the same function - whisky. There are then basic guidelines to the style, which are always open to a brewers interpretation and inventiveness, but grounded in what is universally acceptable as the fundamental basis of the production process. 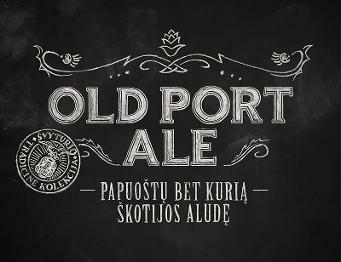 This creation interestingly comes from one of the oldest established breweries in Lithuania, Svyturys at Klaipeda, and its reputation, like so many other breweries in Europe, is based around producing bottom fermented lagers. Within its range are a number of imitations of other styles, Pilsner (originally from the Czech Republic) plus Dortmunder, Hefeweizen, Marzan and Zwickel, all of German extraction. This is standard practice, and as such beer styles gained in popularity and spread across Europe in the late 19th Century so they were imitated by other breweries in other countries. That is why a' Scottish Ale' within their range strikes a chord of improbability, but not necessarily impossibility. If the additional equipment is in place, ie: top fermenting vessels and the requisite yeast, it could be for real. It would seem the brewery are playing heavily on the colour to fit the Scottish Ale description by stating that they use 'Carared Malt' to give the beer the reddish hue associated with the style. Caramel malts (as they are also known) are made by stewing the green barley and roasting to obtain a particular depth of colour. They are used in the production of Amber, Dark Bocks, Red Marzen and Viennese beers, all of which are lagers - and not ales. True Scottish Ales use roasted barley and black malts in the blend, at around 2%, along with crystal malts to give it the red hue. The most important element however would be the fermentation process. The brewery claim to use a 'slow fermentation process' which is ambiguous, and they do not state by which method. Any quality lager (the German term for 'store') would need a long 'maturation' process in storage. An Ale on the other hand can be made from start to finish over a period of 7-10 days, but dependent on the the strength. A longer slow fermentation would be used for higher gravity brews. Maturation in either cask or bottle could then follow. So the reality would appear that 'Old Port Ale' is really not quite what it seems and qualifies as nothing more than a darker coloured Bock style. Interestingly at least one company selling the product claim it is made using 'top fermented' yeast, but on the evidence of having tasted the beer I would beg to differ. From a quality producer such as Svyturys this seems a curious and largely unnecessary creation given their lager heritage, which seems to be more born out of marketing opportunism rather than brewing credibility. It is hard to know exactly who they are aiming the brand at - but no doubt the marketing company employed by Svyturys could tell us their intended logic. This really does seem to be a case of pulling the Highland wool over the consumers eyes!